Gems tropical colors lure into awe with the design of this necklace by Sirada. 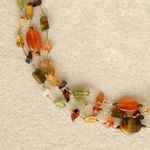 Carnelian mingles with tiger eye, peridot, garnet and quartz, all threaded on golden rayon threads. 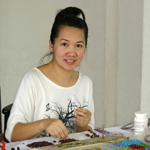 Sirada crafts the beautiful necklace by hand, fastening it with a lobster claw clasp. The length is adjustable. 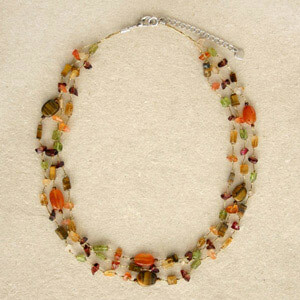 Materials: Tiger eye, carnelian, peridot, garnet, quartz, glass, rayon and stainless steel.